Cindy Friedman, Candidate for the 4th Middlesex State Senate seat , submitted her nomination papers this Tuesday to the Massachusetts Secretary of State’s office. The nomination signatures were accepted and registered, officially placing Friedman’s name on the ballot. 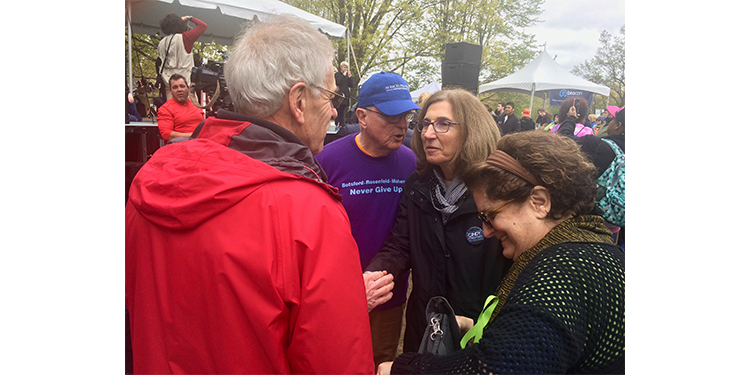 A strong advocate for reforming the mental healthcare system in Massachusetts, Friedman also attended the National Alliance for Mental Illness (NAMI) Walk on Mother’s Day alongside NAMI Massachusetts President Tom Scurfield and Boston Chair Steve Rosenfeld. The NAMI walk, occurring during Mental Health Month, seeks to raise awareness of mental illness, fight stigma, and provide support for families throughout the nation. Working alongside the late Senator Ken Donnelly for the past nine years, Friedman has helped those with severe mental illness and substance use disorder get access to critical services. She has put pressure on insurance companies to ensure parity of treatment, and fought to divert those individuals away from the criminal justice system and into appropriate care. The special election primary for State Senate for the 4th Middlesex District is scheduled for Tuesday, June 27th. The 4th Middlesex includes Arlington, Billerica, Burlington, Woburn and precincts 1, 2 and 4-7 in Lexington.